Source output on (default setting when starting the interface). Switching mode: DC mode (default setting when starting the interface). Voltage control mode: internal regulated control (this leads to accurate output voltage, according to the calibration file of the HVPS). You can change voltage control mode (4) only if the voltage set point (5) is 0V, and the source output (1) is off. It should be kept on regulated except for very specific applications. 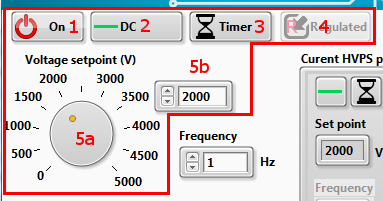 Set the desired voltage with either the knob control (5a), or the digital control (5b). Button (1) allows to easily turn the HVPS on/off, i.e. to toggle the output voltage between the voltage defined in (5) and 0V. You can also press on your keyboard space bar if the interface window has the focus to toggle the state of button (1). In addition to these settings, the 6VDC power jack must be plugged in, and the high voltage enable switch (s2) must be in position 1 in order to have high voltage at the output.